I have always wanted to volunteer with Habitat for Humanity, but, for some reason or another, I did not find the right opportunity to do so, until our Social Committee coordinator proposed that we volunteer as a company. I signed up, and "volunteered" my teenage son and daughter. They both thought it would be a great idea and agreed to participate. In addition to this trio, several other CA members and a friend signed up. Habitat for Humanity did a wonderful job providing us the necessary information about what we would be doing, what we needed and the location of the project. On the work day, the CA Team showed up on time and ready to go. One of the work options they provided was "dirt work", a Civil Engineer's dream come true. Needless to say, we jumped on that one. The regular Habitat for Humanity volunteers welcomed everyone and explained our tasks for the day. Our team was to move "dirt" from the dirt piles and spread it in the backyard of one of the homes under construction to create a well graded and drained backyard. The temperature in the morning was still below 100, and the energy level was still pretty high. The Team, including the two teenagers, did a great job moving the dirt and grading the back yard. Later on, Jana and the teenagers took on painting the porch. By lunch time, we were all pretty hungry. We stopped, ate some sandwiches, and a watermelon! At that point the temperature was a toasty 102 Degrees, and the watermelon was very well appreciated. At the end of the day, we were all having pains in muscles we did not know we had, but everyone agreed that this was a great and worthy experience and that we would definitely participate again. The most rewarding part was to work and interact with the future owners of the home. Habitat for Humanity requires that families participate in the construction process or in other volunteer activities in order to be eligible to purchase a home. These homes are sold at no profit and with a zero percent interest mortgage. See http://www.austinhabitat.org/about_us/new_home.php for additional information and how you can sign up to help as an individual or a group. When conducting a survey, many owners, title companies, and attorneys will ask for all encroachments to be shown on a survey. This is a difficult order to fulfill. According to Black’s Law Dictionary, Sixth Edition, an encroachment is “an illegal intrusion…”. To put it in simpler terms, an encroachment occurs when a man-made object (improvement) crosses a property line or easement line AND the owner of the easement or adjoining parcel does not allow the improvement to be there. From the surveyor’s perspective, how are we to know what is allowed or not allowed? I contend that is not the surveyor’s charge to decide what is allowed or not allowed. It is the surveyor’s responsibility to report what he or she finds at the time of the survey and simply report the facts. This becomes a little more complicated when it comes to fences. In the field, it is hard to determine the ownership of a fence (who paid for it) without looking at a receipt. Therefore it is next to impossible to determine if there is an encroachment or not. However, it is possible to show the position of the fence relative to the property line without regard to the ownership. Most boundary and title surveys will show all improvements within five (5) feet of the property lines. This will give a clear idea of what may or may not cross the line. When everything is said and done, the word “encroachment” is a legal term. A surveyor can, and should, should show intrusions or protrusions of improvements across a line and let the lawyers decide whether or not it should be there. By: Miguel A. Escobar, L.S.L.S., R.P.L.S. Many may not know that the CAD industry has been around since the 50's. 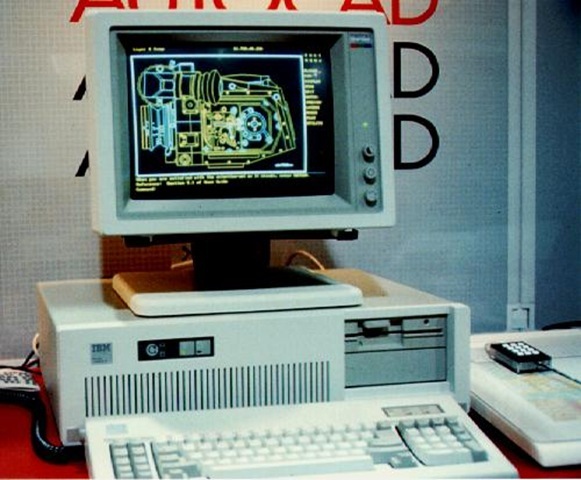 It started off with various confusing acronyms but the most typical was CADD “Computer Aided Drafting and Design” and the commonly known CAD “Computer Aided Design”. In the 60’s the CAD industry was just starting but, initial hardware and software running at the time known as the workstation was not cost effective. Many companies used hand drafting as a typical approach to civil engineering design. During this time a construction plan set didn’t have a lot of redundant information. Having this kind of information would have made changing the design especially at the end of a project very tedious and time consuming. A great deal of plan set review also had to be implemented due the sheer strain of doing everything by hand. This type of drafting continued in some regions of the US until the 1980’s. As time passed hand drafting became a thing of the past and the CAD industry became a major player in how a construction plan set was produced. As it got easier to obtain workstations and trained employees, various different civil software programs were marketed each having their own pros and cons. Even though everything was still designed by hand, technology made it easier by putting the calculations into a 2D line work form. It was still manual drafting. The workstation became an extension of the technician. It lessened the amount of strain on the designers, but still required the same amount of plan set review. Slowly the CAD industry standard was set and stayed there unchanged for some time. Since the beginning of the 2000’s, the technology has pushed the CAD industry into the three dimensional realm. CAD software now allows one to create a virtual model of a project instead of just 2D line work. This virtual model has the capability of using clash detection for conflicts in underground or in building utility lines, updating quantities on the fly and text labeling now reads straight off the model. This makes a complex set of construction plans, with today’s push for redundant information, actually easy to produce and easy to change at any point in the project. This is an exciting time in the CAD industry with all the latest techniques and practices applied to civil engineering, land planning, and surveying disciplines. Cunningham-Allen is proud of our consistent level of knowledge in the software techniques and practices of the past and equally as proud of our efficiency with today’s software. In June of 2003, Cunningham-Allen, Inc. (CA) was retained to work in conjunction with the project Civil Engineer on the design and permitting of the new Lowe’s store in Southwest Austin. The project site is in the Edwards Aquifer Recharge Zone and in the Barton Springs SOS Zone. These are environmentally critical areas established by the Texas Commission on Environmental Quality (TCEQ) and the City of Austin (COA), respectively, and require additional water quality measures and permitting. In particular, the Barton Springs SOS Ordinance imposed a “zero degradation” standard to storm water quality, meaning that water quality measures had to ensure that the quality of the storm water runoff flowing over the improvements has been returned to its pre-development condition before it is released from the site. CA was very familiar with these design requirements because we had worked with the City of Austin on developing water quality measures for one of the first projects that had to comply with this new ordinance. For the LOWE’S project, we worked in conjunction with the project Civil Engineer and designed a system that collected all the storm water that runs off the impervious cover (such as roofs and parking lots) and directed it to a retention basin. Storm water is allowed to settle in the retention basin for 12 hours, then it is pumped via a pumping system to be irrigated over an area of the site that had been dedicated for this purpose and left undisturbed. The size of the irrigation area was calculated based on the estimated volume of runoff (or water quality volume) and the estimated soil infiltration rate such that the entire water quality volume infiltrates the soil and is naturally treated through the existing vegetation’s root system and other microorganisms. As an additional measure of safety, berms were constructed downstream of the irrigation field such that runoff, if any, is captured and recycled through the retention pond and irrigation system. This design, known as a “retention/re-irrigation system” was submitted to the COA and was approved with minor modifications. As mentioned above, the project was also under TCEQ’s jurisdiction, which required specific permitting for storm water and wastewater. CA prepared the necessary permit applications and assisted the Owner in securing these approvals as well. Finally, CA was excited to participate with the Owner, the project Architect, and the Civil Engineer on this project to assist them in securing a Bronze Certificate for LEED design (Leadership in Energy and Environmental Design) based on the innovation and effectiveness of the water quality system. One of the most important items that the client must provide before a surveyor can get started on a survey is the “Right-of-Entry” to the property. If surveyors cannot enter onto the subject land, then they cannot perform the survey. Boundary surveys complicate the need for permission to enter because surveyors need to gain access to the adjoining lands to find and measure the adjoining land’s property corners. Limited surveying of adjoining properties ensures that there are no overlaps, gaps, or other issues with the common boundary lines. In Texas, surveyors do not have a right-of-entry statute like some other states. Therefore, surveyors must gain permission in other ways. One of the easiest ways is for the client to notify their neighbors and ask permission for the surveyors to enter onto the neighbors land. The surveyors can also try to contact the neighboring land owners when they arrive on site. Another way is for the surveyor to send out “right-of-entry letters”. This letter informs the land owner the need for a survey and asks for permission for the surveyors to have access to the land. The letters also have a space for any special requests that the surveyors must adhere to when on the owners land. Notifying the land owners prior to arriving on site helps in two ways: safety and timing. First and foremost is the safety issue for the field crew. Many land owners are protective of their lands and rightfully so. We would not want to alarm the property owner and cause them to pull a firearm on the field crew or worse fire upon the field crew. Another safety concern is the actual access to the land. It is much safer for the field crew to walk through a gate opened by the land owner, as opposed to jumping over the fence. I know of one instance when the land owner turned on an electrified fence when the survey crew member was halfway over. It did not end favorably for both the land owner or the crew member. Dogs and other protective animals are also a concern. If a property owner knows the survey crew is coming, they can contain the animal(s). Second is the timing issue. When the surveyor waits until the field crew is on site to notify the land owner, the surveyor must assume the land owner is there to give the permission. If the land owner is not on the property and the surveyor deems it necessary to go on the owner’s land, then the safety issues stated above arise. In all instances, the coordination of the right-of-entry takes time. When the surveyor sends out the right-of-entry letters, they must spend time researching the names and addresses of each of the adjoining land owners and individually addressing and mailing the letters. Once the letters are sent, the surveyor must spend time to keep a log of which letters have returned, the status of the authorization (access granted, access denied, or conditional access), and which letters must be followed up on. During the course of the project, the surveyor and survey crew must be keenly aware of the status of the authorization of each of the tracts of land. The surveyor must keep track of whose land they can or cannot enter upon, the gate access codes or keys, and any special conditions they must adhere to. Some of the possible conditions are keeping gates closed and locked, no smoking and leaving the property in the same condition they found it. If a land owner does not grant right-of-entry, the surveyor has few options. One option is to seek a court order authorizing the surveyor to cross the land. The surveyor may apply for an order under Section 1071.358 or Section 1071.3585 of the Professional Land Surveying Practices Act from the District Court in the county in which the land is located. The court shall grant the order on proof that the person is a registered professional land surveyor and that the issuance of a court order authorizing the person to cross the land is in the public’s best interest. Caution is taken by the surveyor when doing these types of surveys. Surveyors are liable for damages performed before the compensation is paid. Surveyors have been fined for damages because they cut trees for traverse lines, to create the ability to sight various points for the survey, when other methods of surveying can be made. In conclusion, right-of-entry to the land to be surveyed may seem like a simple issue but without it the survey cannot be performed. One of the first steps in the entitlement process within the City of Austin consists of zoning. Zoning imposes requirements, limitations, and restrictions for a property and defines “ranges” in uses. Residential, commercial, and industrial base districts are arranged in a hierarchy that begin with the Lake Austin (LA) base district as the most restrictive and ends with the Limited Industrial (LI) base district as the least restrictive district. The purpose for zoning is compatibility in the most simplistic definition. A buyer or developer wants to know what is planned around them if they are investing in a property. This extends the spectrum whether one purchases a home or a commercial property. It’s more of “insurance” to know whether a home will be abutting a supermarket (commercial use), a school, a greenbelt, or another home in the future. Zoning defines what can be situated on the property. There are allowable uses that can be placed on a zoning district that are more restrictive. I referred to these as “ranges” in uses. More often than not the allowable uses in less restrictive zoning districts are usually grandfathered structures/uses. Thus, allowable uses must be taken into account when determining restrictions based on zoning. An example would be a residential home located on a commercially zoned property. If the surrounding properties are all commercially zoned, the residential home would be considered as the more restrictive single family (SF) zoning. The City of Austin’s zoning (chapter 25-2 in the Land Development Code) does account for such cases, so the code must be delved into in order to determine the impacts on the property one is developing or rezoning based on the surrounding zoning and land uses. Thus, when you are buying or developing a property it is necessary to investigate not only the zoning and range of uses of your property, but also the surrounding properties. by Rubén López, Jr., P.E. Commercial Design Standards have been a part of the City of Austin Design process for several years. Cunningham-Allen embraces the concept of the standards and think there are many ways of complying with the intent of the ordinance while continuing to achieve our clients’ goals by producing a project of excellent quality. This is the first part of several upcoming articles about the Design Standards. How do you determine how the Commercial Design Standards (CDS) will impact your project? development built prior to an adopted transit station area plan. What land use is being proposed? If the project is single family residential, it is exempt from this ordinance. Any other use: commercial, office, multifamily, or industrial will all require compliance with all or varying parts of the standards. What type or types of “roadway or roadways” as defined by the standards, provide access to the project and what happens if the project is fronted by more than one roadway? The impact of each of the varying roadway types on which your property has frontage determines the relationship of buildings to streets and walkways; whether you will have to “pull” your building up to the property line with room for sidewalks and tree/furniture zones, or whether you can have parking located between the street and the building. If your site has frontage on more than one type of roadway, the highest level of roadway is the roadway that determines your building and parking placement. There is a hierarchy of street types listed in the Design Standards. 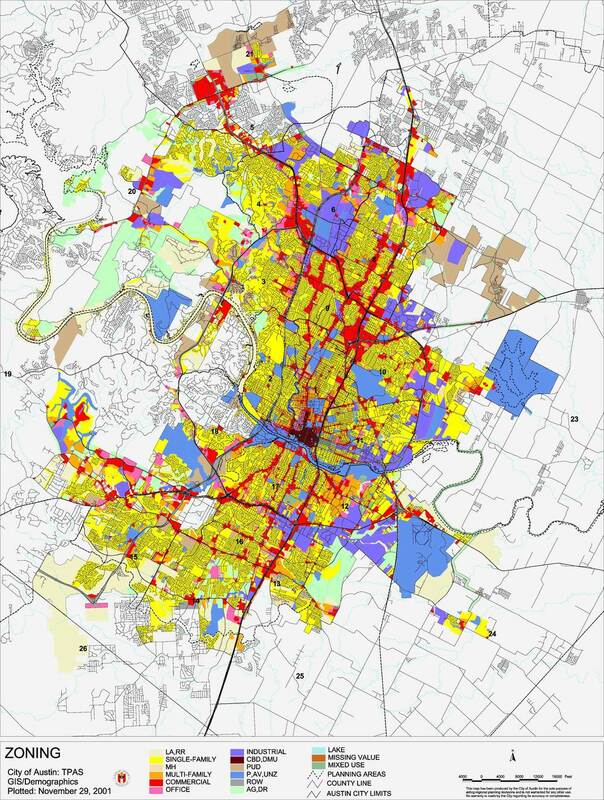 The most important to least important in the city’s design strategy is as follows: Core Transit Corridor, Internal Circulation Route, Urban Roadway, Suburban Roadway and Highway or Hill Country Roadway. There are several maps at the beginning of the Commercial Design Standards section that depict Core Transit Corridors, Future Core Transit Corridors, Urban Roadways and Suburban Roadways of the city. Internal Circulation Routes: Any public or private street in a development. Urban Roadway: Any street that is not a Core Transit Corridor that is located in the center of the Austin City Limits as shown on Figure 1 of the Design Standards (See Image). Suburban Roadway: Any street that is not a Core Transit Corridor that is located outside the boundary of the Urban Roadway area. Highways: Includes all the freeways, expressways, parkways and frontage roads listed in the Austin Metropolitan Roadway Plan, except for Core Transit Corridors. Hill Country Roadways: If your project fronts on a Hill Country Roadway as defined by the list of Hill Country Roadways within the Design Standards, the first 1000 feet of your project will have to comply with Hill Country Roadway standards of the Land Development Code in conjunction with the Commercial Design Standards. For example, if your site is located on Lamar Boulevard, your site faces a Core Transit Corridor. 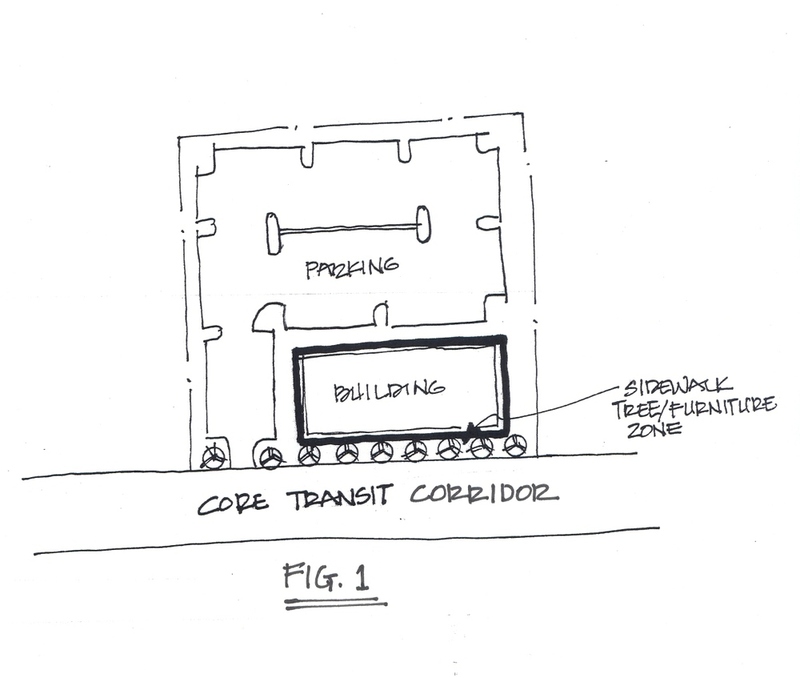 Building placement on a Core Transit Corridor requires the creation of a 15 foot wide sidewalk and tree/furniture zone between the street and building, to provide an environment that is supportive of pedestrians. 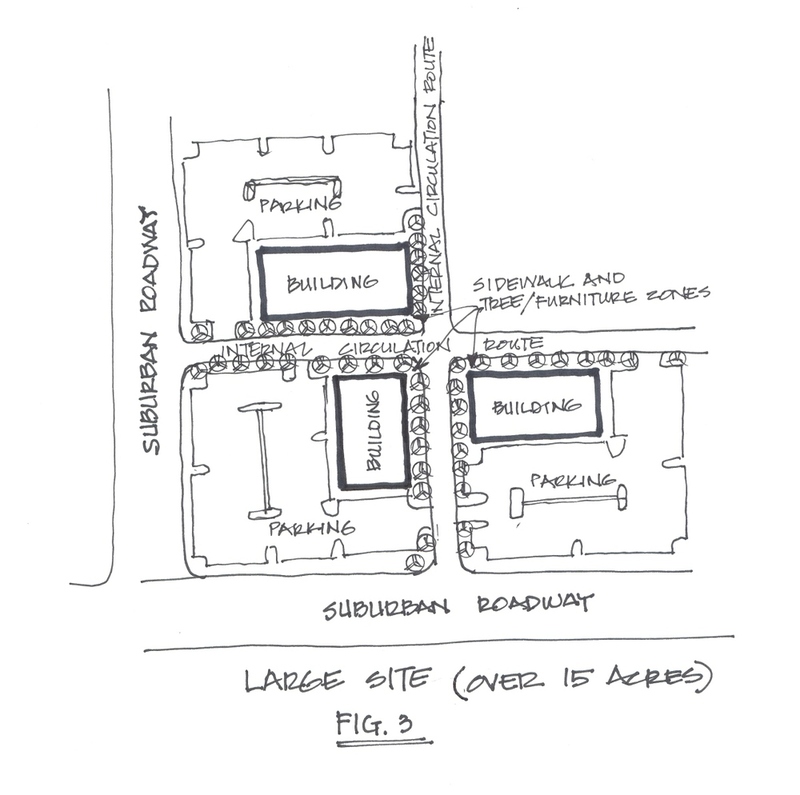 If your site is located on a suburban roadway, public sidewalks are required but you have choices as to whether to place your building adjacent to the sidewalk and street or to have parking between the sidewalk and building. If you choose to “pull” your building up to the sidewalk and locate the parking behind and beside the building, you will be exempt from connectivity requirements. Connectivity is described as the internal circulation system for a large site. At this point, the size of the site (number of acres) will help make the location decisions of the building and parking with reference to the roadway frontage. If your site is five acres in size or larger, you may choose to design the site with buildings fronting on internal circulation routes created by dividing the site into blocks no longer than 660 feet by 330 feet. On sites larger than 15 acres, the site may have one block with a maximum dimension of 660 feet by 660 feet for each 30 acres. Corporate Campuses are exempt from the maximum block length requirement. The following sketches illustrate some of the possibilities of building placement along some of the different types of roadways and along the internal circulation route of a larger site. Remember, the goal of the Commercial Design Standards is to provide guidelines enhancing each project and helping create a community with multiple land uses, utilizing pedestrian access to provide enjoyable living environments. Next time we will discuss more specifics about building placement and building design requirements. In 2007, Dripping Springs Independent School District’s (DSISD) Bond included a recommendation to convert the existing High School to a new Middle School and to expand and convert the existing Middle School to become the new High School. This was based on a two-year long study conducted by the DSISD’s Long Range Facilities Planning Team consisting of 74 community members representing every part of the school district attendance area, including parents, grandparents, business owners, teachers, principals, district administrators and support staff, board members, retired community members, and consultants. Cunningham-Allen, Inc. was honored to be selected to work on both conversion projects and provide Surveying and Civil Engineering services. The construction operations had to be carefully scheduled and coordinated with the school schedule and design required the facilities and services (water, wastewater, drainage, and parking) to be phased to achieve a conversion without service interruption. As you would expect, both projects presented several challenges. However the civil engineering challenges we faced converting the existing Middle School to the new High School were truly unique, especially the design of the wastewater service. The existing Middle School was designed for 1,200 students and occupied a 40 acre site including an on-site wastewater treatment plant (WWTP). The new High School was to house 1,800 students, with a future capacity of 2,500 students. The district purchased an additional 60 acres to accommodate the additional facilities associated with a High School campus. Due to the significant increase in population and the planned expansion of the existing building, the existing on-site wastewater treatment plant had to be abandoned, completely redesigned at a different location and permitted to meet current State of Texas code. As the design of the new on-site WWTP was underway, the team learned there was a possibility the City of Dripping Springs could provide wastewater service to the school. This option was attractive to DSISD since it was more economical and would eliminate substantial maintenance and operation costs associated with an on-site wastewater treatment plant. In order to connect the school’s wastewater lines to the City’s system, a different wastewater collection system would have to be designed and constructed. DSISD and the City of Dripping Springs started the necessary negotiations immediately, but it became clear the time needed to reach a final agreement might take longer than the planned opening date of the new High School. A reverse schedule was prepared, starting from the opening date and listing the major design, permitting and construction milestones and “drop dead” decision dates that would have to occur for either of the wastewater options to be in place by opening day. Based on that reverse schedule, DSISD decided to proceed with the design and construction of both options until the final agreement between the District and the City had been reached. By the time the agreement between the City and the District was reached to use the City’s wastewater system, the on-site wastewater treatment plant had been completely designed and permitted, and the majority of the on-site wastewater infrastructure had been constructed. Luckily, no construction on the on-site wastewater treatment plant had started. The coordination of the design, construction, and school schedule was very challenging with a looming, unchangeable opening date. In the end, having a team that was willing to work together toward one goal paid off. The entire project was constructed on schedule, on budget, and without one day of missed school – much to the dismay of the students! Ponds: Why do I need one? What are my choices? If you are going to develop land around the City of Austin, you need to be aware of how important water quality is. Below is a list of parameters you need to follow depending on the metrics of your development. Water quality is required in the City of Austin when a development site exceeds 20 percent impervious cover using the net site area of your site (LDC 25-8-211). If you are in the Barton Springs Zone water quality is required for all development. The Texas Commission for Environmental Quality (TCEQ) requires water quality when development takes place over the Edwards Aquifer. The standards for design and construction of these water quality controls come from the Land Development Code and the Environmental Criteria Manual of the City of Austin. If the development is outside the City of Austin but over the Edwards Aquifer, TCEQ standards apply. When developing inside the City of Austin and over the Edwards Aquifer typically you can follow the City of Austin standards and your finished pond will meet the standards of TCEQ as well. However, calculations must be shown by both standards to the respective reviewing entity. The list above explains why you need a pond, but what choices do you have to construct? Two of the more common choices are a sediment and filtration pond or a wet pond. The sedimentation and filtration (sed-fil) pond is made up of a sedimentation basin or chamber and a sand filtration bed. The basin and bed are separated by a rock gabion wall which is used to block large trash from entering into the sand filtration bed. The “first flush” runoff (required to be cleaned by the City of Austin) enters the sedimentation part of the pond where large particles and trash settle to the pond bottom. The sand media cleans the pre-determined amount of runoff as it percolates through and into perforated under-drain pipes. The clean runoff is then released from the filtration part of the pond until the entire pond is empty. A wet pond gets its name from its nature; always being full of water. This fundamental difference is used by developers as an aesthetic benefit and used by engineers as a way to clean the runoff from the site before it returns to the environment. The forebay acts in a similar way as the sedimentation basin of a sed-fil pond. The main pool is separated from the forebay by an earthen berm. A substantial portion of the pollutant removal in wet ponds is due to biological processes caused by the plants that border the pond. From a cost and constructability standpoint, a sed-fil pond is typically less intensive. They are typically the water quality control of choice for commercial, multi-family, and school development. Wet ponds tend to become desirable when serving larger single family developments, in which case they also serve as an aesthetic benefit to home buyers. CANstruction is an event put on yearly allowing companies to get together and build a structure out of canned food, show it off and then donate those cans of food to the Capital Area Food Bank. Our team was building a Gingerbread house. However Engineers do not give up this easily and so they set out to build it better and more structurally sound. It took about an hour on Friday night to get the cans and wood into the mall so it was ready to build on Saturday morning. Bright and early (8 am) on Saturday morning they set out to build a beautiful Gingerbread house. How do you think it went? The interior structure is really impressive. The use of the small triangular wood structural supports is very impressive. Also, there were tiny wires and 3/4" plywood braces taped with Duct Tape holding the columns and roof together. If you want to see more photos of it, jump over to the CANstruction Austin Facebook page.